When the Libyan rebellion started last month, there was a sense of bravado among the opposition fighters, almost a sense of invincibility as one city after another fell to them. Starting in Benghazi and Tobruq, moving west to Ajdabiya, Brega (al-Burayqah) and Ra's al-Lanuf, then on towards Sirte. There were signs and placards calling for a no-fly zone, huge signs picked up by the media. I remember the words written in Arabic asking for a no-fly zone, for help, but no troops on the ground. 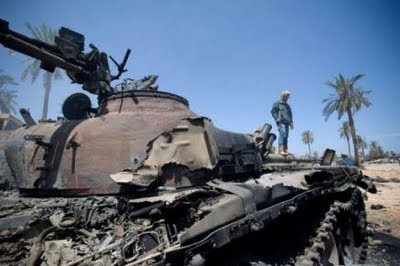 Then the Libyan military got its act together and started using air power in conjunction with its armor and artillery. The opposition quickly learned the value of superior firepower and a modicum of military training. The Libyan military is not renowned as a potent fighting force - they would not last but a few weeks against any armed forces with any real training and modern equipment. Against a rag-tag band of rebels with no armor or artillery, and air power or ability to defend airspace over its positions, the Libyan armed forces are actually quite effective. The Libyan air force was effectively neutralized with the declaration of a no-fly zone. While it might be effective against a domestic rebellion, it's ability to confront the air forces of the United States, the United Kingdom and France is non-existent. They were wise to stand down. That said, watching the media coverage of Libyan army operations against opposition forces tells the story, and today's request by the opposition for foreign forces on the ground is the result. The Libyan army may be a Third-World military force, its equipment may be old and its personnel not the most disciplined in the region, but against an untrained, ill-equipped rebel force, it can bring devastating firepower to bear. It was obvious that someone in the Libyan army had attended military training courses. The massed artillery fires and deployment of forces indicated a basic understanding of military tactics. The rebel demand that there be no foreign ground forces was short-sighted to say the least. 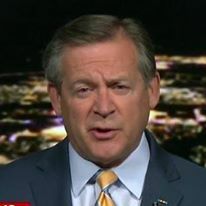 Of course, they were indirectly applauded for that decision by the ill-advised statements by U.S. President Barack Obama that no American ground forces would be deployed. This is just another example of a naive, inexperienced commander in chief telling adversaries what tactics will and will not be used. All the President's statements did was embolden the Libyans to use what effective forces they have - armor an artillery. Although the opposition learned one lesson of air power, they did not take the graduate-level course. The no-fly zone was able to blunt some of Mu'amar al-Qadhafi's military operations. However, once the fighting came to the cities, there was no way to decisively stop the government forces from effective operations without trained air combat controllers on the ground. It was obvious to anyone with military training that without a coordinated air-ground operation, it would only be a matter of time before the better trained and equipped Libyan military would overcome the rebels. It appears that as the fighting intensified, it became obvious to the opposition forces that although they had courage and the righteous fervor on their side, it was no match for the superior firepower of the trained Libyan army. As more Libyans with military experience joined the opposition, they may have been able to temper some of the earlier bravado with the realization that they need help. Without some military support on the ground, their cause is lost. Now we have Nuri 'Abdullah 'Abdullati, a member of Misratah's governing council, requesting foreign troops, saying , "we did not accept any foreign soldiers in our country, but now, as we face these crimes of Qadhafi, we are asking on the basis of humanitarian and Islamic principles for someone to come and stop the killing. Before we were asking for no foreign interference, but that was before Qadhafi used Grad rockets and planes. Now it's a life or death situation." Asking for assistance is a good first step; it provides legitimacy for troops to assist in coordinating the air attacks to bring precision air power to bear. It is akin to the Arab League calling for a no-fly zone. If I were the Libyan opposition, I would downplay the "Islamic principles" argument - it does not play well in the West, especially the United Kingdom and France. The British have stepped up to the plate; the French have not. This is a bit surprising since France was the first Western power to commit forces to the Libyan effort. The French claim that military action will not bring down Qadhafi. There are the usual academic think tanks echoing that same line. On the contrary, force is exactly what will bring down Qadhafi, perhaps the only thing that will remove the dictator. The only words that will resolve this crisis are Qadhafi saying "I quit." I do not envision him saying that unless his forces are defeated and he has no other way out. You cannot reason with Mu'amar al-Qadhafi; he must be driven from power by force. The rebels know that - it is why they are asking for military support, not diplomatic efforts. Again we are at a decision point. Either we support the opposition with some ground forces or we allow the current stalemate to continue. If we allow the stalemate to continue, eventually Qadhafi's forces will prevail. The British will send military officers to Libya. One hopes they are combat controllers who can coordinate NATO air strikes and break the stalemate. One also hopes that President Obama has come to his senses and ordered covert U.S. special operations support as well. If not, call me - I'd be proud to help.